I’ve been avoiding restaurants in Australia because they are damn expensive. In Sydney, a restaurant can cost around $25-40 dollars on an average. Some even demand reservations. It’s crazy. Even New York is starting to look cheaper. In Leura though, I had my worries that we would be out of a table for dinner because there was hardly any restaurant in the area. Fortunately, Leura Garage was open and they had a nice cozy space with awesome food at a reasonable cost. It’s actually a renovated garage opened up to curious transients like me. If there’s such a thing as clean grit, then I suppose this restaurant has it. Parched from going around, my friends and I started with some drinks. I ordered a capirinha, a drink I had no idea how it tasted but the idea of cachaca, lime, and muscovado sugar delighted me immensely. I honestly haven’t tasted cachaca before but figured that what I don’t know won’t hurt me. And boy was it good. I could drink it everyday and never tire of it. Choosing what to eat was a lot difficult because there were tons to order. We’d order everything but our stomachs had its limits. Considering our diets, we had an Ocean Board, a tray of seafood, then roasted heirloom vegetables, and some pork ribs. We thought it was a modest selection but wow… didn’t think we’d get a lovely treat for its price. The Ocean Board arrives first and I started to hate the world. Just how can you eat such a beautiful platter of food? 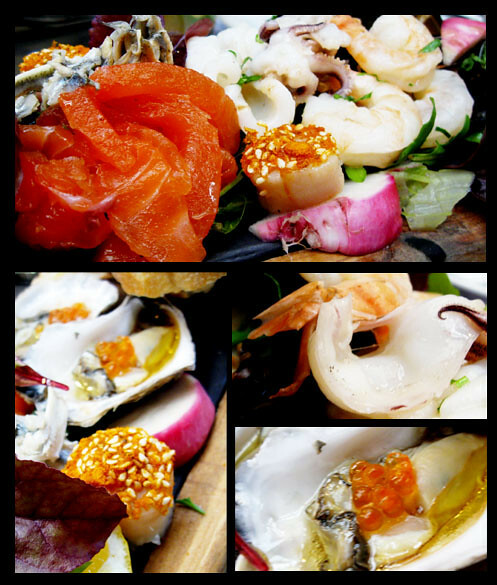 Seafood fresh and glistening, wobbling slightly at the slight nudge, an unexpected tease that we couldn’t resist. To this day, I still suffer thinking how awesome that food. If I wasn’t hungry, I would have savoured her more. Maybe sang songs and poems. Danced a little. Maybe treasured those flavours a little more in my mouth. But just when I was letting that oyster slide in my mouth, here comes the pork with the roasted vegetables. Well… that’s another thing. 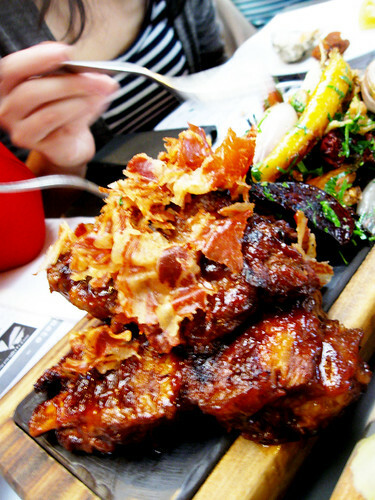 The thing with pork ribs is that you expect it to have particular flavours. It isn’t exactly a barbecued rib, but the braise had enough tartness and sweetness that pork just makes me sing with joy. It also had bacon flakes on top. Not the bacos kind but paperthin bacon flakes. Or chip in this side of the world. It was such a harmony of flavor that I regret forgetting the Ocean Board. 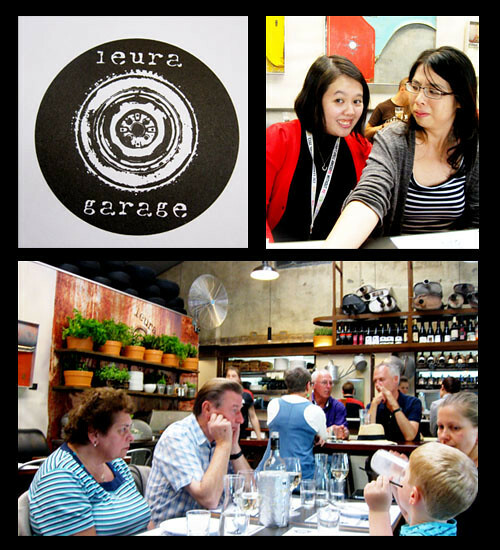 Dinner at Leura Garage was a good introduction to the awesome food found in Blue Mountain. Not that I managed to taste others during my trip, but it’s set such a high standard that I’ll probably be expecting nothing but the best from other restaurants in the area. I think because we decided to indulge a bit (and we had drinks) we paid around around $120.00 for everything. That’s still quite expensive. However, if I ate the same thing in the city, it seems it’ll cost $200.